The Honeywell DR65 Dehumidifier is a high capacity unit designed for whole house dehumidification. This unit is ideal for smaller homes (up to 1800 sq ft) and may be integrated into an existing HVAC system to reach all areas of the house or apartment using the associated ducting system. Alternatively it may be operated as a powerful free standing dehumidifier in problem areas of any home, such as a crawlspace, basement or attic. The Honeywell DR65 Whole House Dehumidifier is an Energy Star qualified unit and has high energy efficiency. This unit boasts an energy factor of 2.02 litres per kilowatt hour, considerably better than any room dehumidifier of comparable water extraction capacity. The dehumidifier is designed to fit into the smallest possible area and requires very little head-room making it suitable for location in a crawl space if required. The external dimensions are only 12 x 12 x 28.5 inches, including collars so installation should be not be a problem in any home. As a whole house dehumidifier the DR65 can be integrated with the HVAC system of the home using existing ducting. Alternatively if there is a particular problem area, such as a crawlspace, basement or attic where a powerful and economical free standing unit is needed the DR65 fits the bill. The Honeywell DR65 is capable of low temperature operation which makes it suitable for installation in cooler areas of the home. Dehumidifiers built for operation in the warmer living areas of the house frequently struggle when used in the cooler temperatures of a crawlspace or basement. This unit is designed for these tougher environments and is far more effective than a room dehumidifier in dealing with them. It is also a very low maintenance unit to suit it for operation in less accessible areas and apart from an annual air filter change it should need little or no attention. The DR65 incorporates an adjustable humidistat which is used to set the ideal level of relative humidity for your home. This device regularly measures the relative humidity and operates the unit only if and when that level rises above the pre-set percentage. This ensures comfort for the occupants of the home and protection for the home itself and its contents as well as saving energy by ensuring that the dehumidifier operates only when needed. The level you choose will depend on your preferences and comfort levels but to ensure protection against moisture damage and mold, and to deter dust mites, a level not exceeding 45%-50% is required. A particularly convenient feature of the DR65 is a gravity fed continuous drainage facility. Unlike room dehumidifiers this unit does not collect the condensate in a bucket but discharges the water as it collected into a nearby drain or other outlet. Once again this is designed into the dehumidifier to enable it to operate with as little attention from the user as possible. 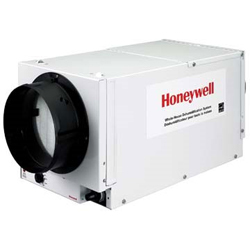 Other aspects of air quality are improved by the Honeywell DR65 in addition to controlling humidity. A MERV-11 Air Filter is installed in the unit which does not merely protect the machine but filters out a large proportion of potentially harmful particles, including many mold spores. The DR65 also improves ventilation throughout the home, a function which can be enhanced with optional extra controls. The Honeywell DR65 is a high quality, durable, energy efficient and low maintenance dehumidifier which can control humidity throughout the home. Such a machine is not cheap; you would probably be suspicious if it was. Even so, taking into account the cost of multiple room dehumidifiers, their shorter working lives, their higher energy costs and the general inconvenience they bring you may conclude that this unit represents good value for money.